Another summery outfit today! I've been trying to make the most of the last of the sunshine before it goes away again. I read somewhere its a supposed to snow next week or something, I'll be pulling my fur coat out again! I bought this dress with the intention of wearing it to LFW, but I opted for something else. I wasn't going to keep this Monki dress but I ended up having to as I forgot to return it before the 28 days and I didn't fancy exchanging it. Oops! Im kinda glad I did keep it in the end as I do really like the way it looks on. Like a lot of Monki stuff it's so simple but has a quirky edge to it with the over layer. Monki is quickly becoming one of my favourite stores! I also wore these Primark sandal wedges that I bought a few years ago. They make my legs look even shorter than they already are but oh well! Off for a bit of shopping on Oxford Street this evening with my Flatmate. 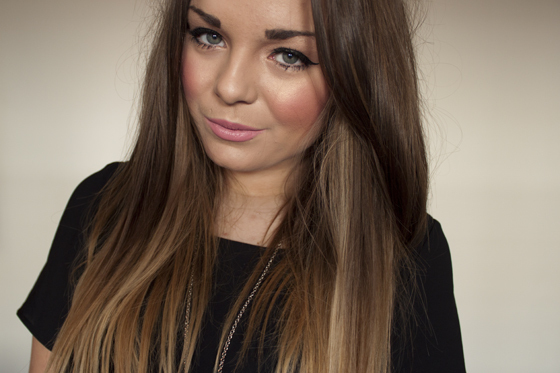 I need to buy a new foundation (probably going to get Estee Lauder Double Wear as per usual!) and some tights (oh the excitement). Im then going to come home and tan and continue with the 30 day shred! I've done it everyday since I started and it doesn't hurt as much as everyone has made out it does! Such a pretty dress :) Defo a keeper, I have far too many black dresses but always end up buying more! I heard its meant to snow too, ridiculous weather! I've never looked at Monki's stuff but I've read good things about them so may have to have a look. Love the necklace, anything cross related is a winner! i forgot to put it in the list, but it does say in the content of the post! they are from primark! The dress has such a lovely silhoutte, and such insanely cool shoes! I absolutely love the dress and shoes! really great look llymrs, love you with straight hair. Loving the dress, really simple but has a nice cut and shape to it! What on earth is the 30 day shred haha!? ^ this! http://www.youtube.com/watch?v=1Pc-NizMgg8 this is the video link! Love the straight and "un-messy" hair on you! and the dress suits you so well! Omg I totally nearly bought that dress the other day, I have a lot of love for monki at the moment, my post from the other day...allaboutthegirlblog.blogspot.com/2012/03/Monki-tee-outfit-post.html they're stuff is so cheap and cheerful. One of your best outfits lately! really nice! oh my god how long does your hair look? Amazing! I love all these black shift/swing dresses that you own! My collection just isn't sufficient anymore! they are from primark, it does say in the content of the post but I forgot to put it in the item list! I love your hair straight the ombre hair really suits you!! Absolutley LOVE the shoes were are they from??? they are from primark! it does say in the content of the post I just forgot to put it in the item list! luv your makeup in these pics!! its medium, sorry i missed your comment i've not had much time to reply recently. haha awh! yeah I've been doing it four or so days and I've found it really easy actually. i might move onto the next level! good luck! mac please me! my all time favourite lipstick! it is really lovely, so flattering and easy to wear! I love your hair sleek and straight like this, it's my favorite! That dress is gorge! I'm loving anything asymmetric at the moment so this really floats my boat! It's said alot, but your hair is looking beautiful, jealous of the length! they are from primark, it does say in the content of the post I just forgot to put it in the items list! You look so beautiful! Your hair is amazing and those shoes! How I long for the day my hair is as long as yours! You've got some amazing locks, Lily! Love the simplicity of this outfit. Yoru hair looks amazing! i'm doing the 30 day shred and was worried that i did it wrong as i don't ache at all!!! glad im not the only one! its so strange! i was expecting to be really sore! gonna keep going and then move up a level! I love the black strappy heels! Lovely, i love this dress it sits really well! Our lovely weather has already disappeared and I've had to hunt out the wooly cardigans again! The dress is so simple but really classic and pretty! Absolutely gorgeous - and love it with the shoes! I love this. Your hair is getting so long! your hair looks gorgeous straightened. I really love your jewellery combinations. Gorgeous outfit, i love the pop of colour the turquoise nails give to the simple black outfit. Such a perfect LBD, monki get quirky basics completely right! Really like the Primark sandals too, I remember nearly buying these and I'm gutted I didn't now! howdy there! this might be my wi-first remark ideal here, hence I plainly needed to blessing a brisk yell out and say I wi-fi extravagant breaking down your articles. ar you ready to plainly embrace another individual sites/sites/sheets action with the indistinguishable things? much obliged tons.